Updated 5 July - Buyable Permanent Sultan's Tabernacle is now available in CAW and the World Editor. Introducing the Buyable Permanent Sultan's Tabernacle for your Sim's homes and community lots. Would you like to create luxuriously indulging camping areas for your sims, but haven't got a fancy tent? Now you can purchase a pre-built Sultan's Tabernacle to place on your community lots or homes. 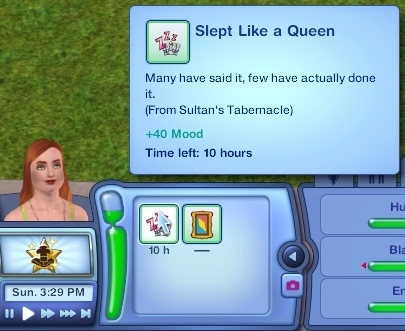 This scripted object mod will allow you to purchase a permanent Sultan's Tabernacle from the Buy Catalog. When you buy the tent from the catalog, it will be placed permanently, meaning, your sim cannot put the tent in her inventory. You can move the tent in buy mode. 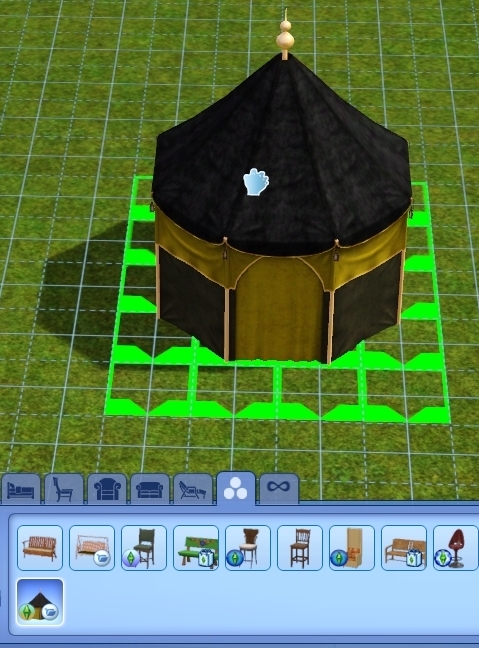 This is similar to the unlocked permanent tents by Simsample, found on MTS. This is a scripted object and, as such, has very little chance to conflict with any other mod. This mod will not conflict with any core mod, script mod, or xml tuning mod. Note: NRaas SleepFreedom will have no effect on this object. This is an OBJD override, which makes EA' Sultan's Tabernacle buyable in the BuyDebug catalog. This is a non-permnent tent. When you buy the tent through the catalog, it will be rolled up in a bag. Your sim will be able to place the tent wherever possible, and will also be able to put it back into her inventory. Built with patch 1.34, and will likely work with earlier patch levels. Requires World Adventures Expansion Pack. Object costs 50,000§ and can be found in the BuyDebug > Misc menu.